Stevenson represents Ward 1 in Norwood, an enclave of Cincinnati with a population of about 20,000. The city is in a fiscal emergency, streets and parks are in disrepair, and Stevenson said she heard a great deal of discontent on the campaign trail. But Norwood is also a close-knit, walkable community where real estate prices are on the rise. 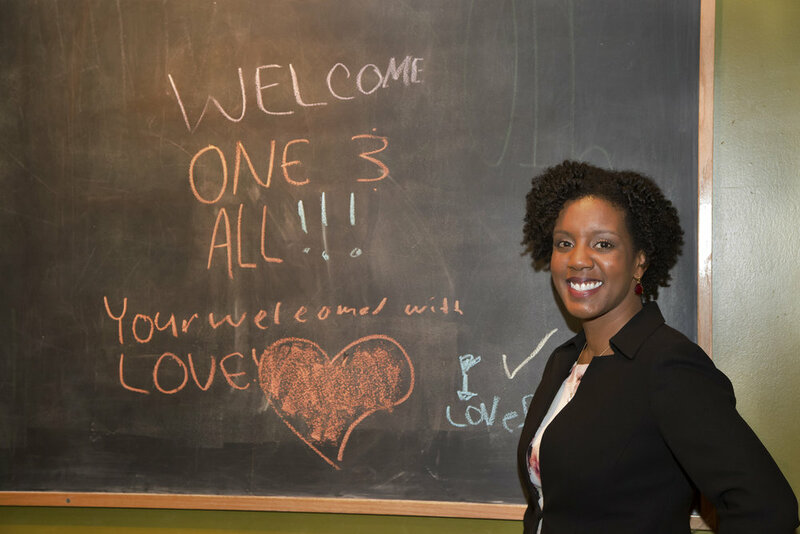 Stevenson ran on a platform of community engagement, and one of her goals is creating a process to welcome and educate new residents so they can get involved in their city. Interview by Hillary Copsey. Photography by Jennifer Mahuet. How did you come to Norwood? I’ve been a resident twice now. The first time was July 2012 and I lived here through August of 2014. Then I moved back in August of 2016. When I was at Xavier University, one of my colleagues lived in Norwood and she had visited this church here, Vineyard Central, where she met my first housemates, Owen and Sandy. I had told her I was getting ready to move; I was living in East Walnut Hills and just felt the transition would be all right. We welcome you where you are, as you are. It was important for me to come to Norwood because I was going to Xavier for grad school. I wanted to be in walking distance. Although I’m not pleased with the state of our sidewalks, I knew, if I moved to Norwood, I could walk to school, I could walk to the grocery, I could walk to the bank, I could walk to the library, I could walk wherever I needed to go, and that was important to me. I really enjoy living in urban areas, and having access to the services I needed was huge. To me, this part of Norwood has always represented a phrase I learned long ago: We welcome you where you are, as you are. That’s been a really unique experience for me here. I continue to feel that at Vineyard Central, just how we do a monthly potluck. This month, I’m greeting, and I love it because I get to be out front, saying hi to everyone, telling everyone to come on in. I have that to give away because that’s what I experienced. It’s pretty cool. I think that’s an example of creating those spaces where, if people are feeling marginalized, they can come connect. For a long time, you didn’t have a car and rode the bus. What did it teach you about our community? Being a bus rider by choice has caused me to have a lot of empathy about the way we make choices and to make sure that all voices are represented. I mean, it’s a policy that one adult can have two children with them. That policy doesn’t work well if you have more than two children in your care. So I find that it’s helped make me pause when I think about transit and consider: Is what’s best for me actually best for others who might need the same resource? You cannot get around Norwood on public transit. You can only go through Norwood on public transit. As a policy maker, and this might sound loaded, but it’s a real legit thing: If you are a non-car owner, that produces segregation. You are where you are until you leave. That’s a lot. I can recall the physical strain on my body – I’m packing all my work for the day, my lunch, I may or may not have a winter coat, I’m managing an umbrella, and I’m trying not to get wet. I’m trying to give myself enough time to get to my stop so I’m not sweaty when I get there, but get there early enough so that if the bus comes 5 to 10 minutes early, I don’t miss my route which could be another hour wait. In the dark. Your work experience is in the nonprofit realm. Why move into elected public service? Nonprofit work, for me, was an introduction in how we respond when policies don’t work well. When I decided to leave Xavier, I became AmeriCorps VISTA. That is a federal position. It is a state-facilitated program, and I chose to be placed right here in greater Cincinnati. I was in Avondale at Gabriel’s Place. But I didn’t know how to say it. I felt like the residents who literally lived in Avondale had more authority to speak. I still felt a little distant from being engaged in change. What do you mean? Translating what and for whom? A lot of times, policies are written based on best practices. They’re not necessarily based on feedback after implementation. I knew enough about how program evaluation could shape policy, but I also understood why residents didn’t want to trust the thing that was being funded in their neighborhood. So, how do you take policy and make it something residents understand? 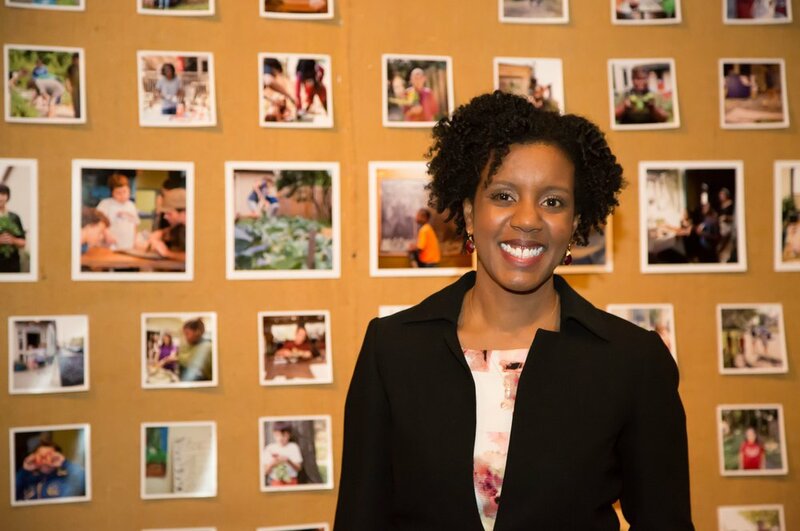 I actually began to work with Denisha’s team as a consultant to the Creating Healthy Communities Coalition at the Cincinnati Health Department. In that role, I was able to come to a place of speaking out, and I decided I wanted to be able to create policy. What has happened in the past still lingers. That’s when I applied for and participated in the Center for Women in Politics and Public Policy at UMass Boston. My experience there was really calling out the role of women of color in leadership locally and at the state level. I spent time not only doing research, but also just clarifying my own thinking about what representation means, about what issues I want to affect, and becoming more comfortable expressing my opinion. You shared in interviews during your campaign that, prior to the election and your decision to run, you weren’t completely comfortable in Norwood. But you decided to stay and be part of the change. Have those feelings for Norwood changed? I actually had a very positive experience in West Norwood. The greater Norwood – I felt like I was constantly coming up against stories of “this is not the place for us.” What has happened in the past still lingers. You talk about the impact of the past lingering. What do mean? I feel like my experience of belonging is more connected to the thought that people see themselves when they see my leadership, because they were a part of the process. When I was campaigning, I didn’t have a car. I had to go to a campaign meeting that was at the Indian Mound Cafe, so I left work, got a Lyft ride, and my driver said to me, “Do you know where you’re going?” My driver used to drive for Metro, and he recollected there was a time when you could not go into Norwood. In 2017, he asked me if I knew where I was going. And in the Norwood Day parade, you did have a big crowd. I knew that meant something in the history of the parade. I heard people usually show up with a dozen or so with them, and I thought, “Well, we have to double that, at least.” Part of that is my consciousness that this – an African American Council candidate – has never been done before. I was very vocal with my campaign team: Just because it has worked for you, doesn’t mean it’ll work for me. It was, at times, a little tedious to educate myself on what it would take to elect a black woman in Norwood. Other times it felt like, well, just do the things that politicians do, because that engine does work. As a candidate, I was very much surprised with people’s willingness to come into this with me. As a public servant, you ask about my sense of belonging – it’s interesting. I feel like my experience of belonging is more connected to the thought that people see themselves when they see my leadership, because they were a part of the process. I don’t know that I necessarily feel more belonging. I definitely say I feel more responsibility. My life has been filled with lots of experiences where I was marginalized, and my way of coping with that has been, in large part, to create spaces where other people don’t have to feel that. Does creating those spaces for people who might feel marginalized help you, too? It does. I think about it like: I’m not alone in this. There are other people who understand this experience without me having to wear a label of being different. It’s been a struggle over the years to think about differentiating myself as a leader. It really takes a person deciding I’m going to do it differently, consistently – not for the sake of being different, but for the sake of being true to myself. I’m not sure how other people have resolved the experience of being marginalized, but I know for me, in my life, it’s often that I’m intentional to make a connection with someone else who might seem to be experiencing that. There’s a lot of solidarity in, even if you feel like you’re alone, knowing you’re really not. I think that really does help me. I’m not the only person who lives in Norwood who has felt like an outsider. 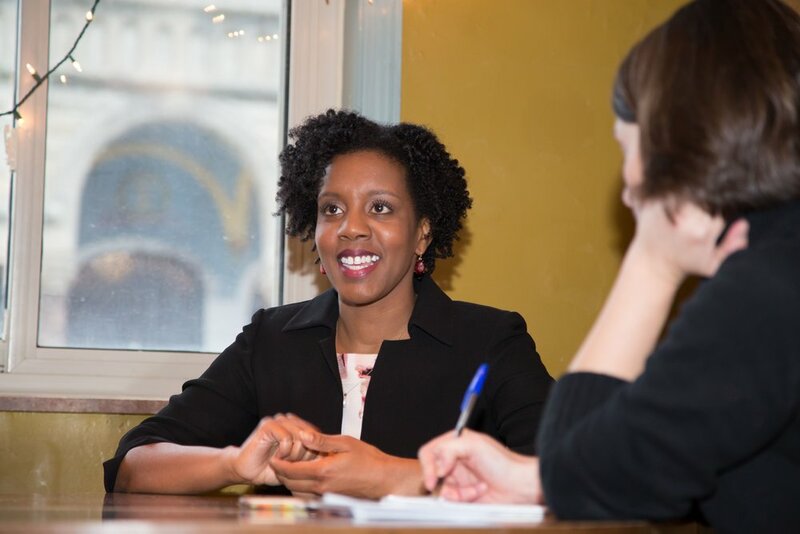 I want to talk about your being the first black Council member in Norwood – the first black candidate, even – but first, tell me more about groups in Norwood who might feel marginalized and maybe have found a place because of you. It dovetails with your other question. I often felt when I was knocking on doors as a candidate that I was getting: “I don’t want to talk to a black person.” So, even though I think community engagement is important, knowing your candidates and elected representative is important. I’ve had people kindly help me know they don’t want to talk to me. I’d say there are some people I don’t think I can help. They may not want that. One of the things that I’m hopeful will help: I mentioned Coffee with Council. I am interested in getting to and also creating spaces where residents can get to know who I am as their representative. I really want to see people move from being consumers of what government can offer them to being co-creators. I’ll be circling back. One of the pillars of my campaign was shared responsibility. Locally, especially, we see: It’s their job to figure it out. Well. To a certain extent, yes, we elected officials are charged with being responsible. I am, I guess in some ways, a purist: I am responsible for figuring out what we want. Not just putting forth my idea. So when I think about the budget in particular, and that shared role, I really want to see people move from being consumers of what government can offer them to being co-creators. I want to be an ally to any resident or organization that wants to increase the quality of life in Norwood. That has been important to me for a number of years. When you first announced your City Council candidacy, we talked and I asked why you thought you were the first African American to run for office in Norwood. You turned that question around: Why did it take the town so long to produce an African American candidate? How would you answer that question? Why was Norwood ready to elect you now? Over the weekend, I had a conversation with a friend, and we were reminiscing around when black men got the right to vote ahead of women, and now fast forward to just two terms ago: We had a similar visual of a black man and a white woman seeking the presidential nomination. And in the local context, some of what allowed Norwood to be ready is we’ve had more residents who are newer to the city join Council. I think of James Bonsall, who served the 2015-17 term, and the fact that he’s not from Norwood. He was regarded by many in the city as a successful city councilor, one who really offered a lot of value, feedback, and just really promoted a lot of goodwill. Knowing that someone could come in who hasn’t always been here definitely created some openness. I don’t believe that we were elected to council to run the city by ourselves. And because I ran at a ward level, instead of what made Norwood ready, it’s probably better asked: What made Ward 1 ready? And what made Ward 1 ready is I had relationships with people who believed I could do it and who wanted to be a part of making it happen. I want to give the city credit for being open. But I can definitely say there was a lot of investment in relationships here before I decided to run, and those were leverage when I did. When people said, “I’m tired of Norwood, I’m ready to try anything,” what do you think people were trying to change? I think people were talking to me about fiscal recovery. I think people were talking to me about streets, lack of programming for youth. I think people also were talking about the lack of transparency. I mean, I had one of the most pleasant conversations on Elm Avenue: “I have never had anyone knock on my door and talk to me. I don’t even know who my current representative is” – and the Council member lived down the street and around the corner because you know, we’re like 20 streets here. I think that’s some of what they were saying. I think the city has been maintained in such a fragile way that it hasn’t always felt comfortable for people to find out more. There is a resounding disappointment in our public discourse about our city administration. I know it’s important for me to understand what is difficult for people to accept so that I can be a resource for sharing the what, the why, the how, and just be clear that we’re bringing people along. I don’t believe that we were elected to council to run the city by ourselves. You have two years on City Council. When you think about the end of your term, what would be success for you? One is participatory budgeting. Because we have such low confidence in how our money has been managed, my goal was to create confidence by giving residents a way into the process. At the end of 2019, I would love to see our community block grant development process to be more transparent, to see more active campaigning to get residents involved with that process, and I would love to see the city start testing what they’re doing with dollars. I’ll give you an example: When I talk to the safety service director, Joe Geers, about the lights on the Norwood lateral, I heard him say, “We only have so much money, and we have to decide what comes next.” I felt like that is an example where a resident council, representative of the four wards, could consult with that person. That participatory budgeting also comes with the idea, my second priority, of our neighborhood associations. We used to have some. I’m actually in the process of reaching out to our law department to find out if those ordinances are still on the books, what did they say, how do we begin to breathe life into that again. If each ward has an active body of residents that could help inform their City Council representative, we’d have more transparency and confidence. I want my home to be a thriving community, and that’s going to take all of us. And the third thing is really an umbrella for all of that, and it’s just welcoming people. I can say I had such a great experience here because I was welcomed. In my first conversation with my potential housemates, they said, “We’ll make you lunch so we can have a conversation.” I had a really deep and strong welcoming experience. But I know other people who live here; I can think of a woman of color – she lives in an apartment; she’s a lawyer; she had no clue what the makeup of the city was, in terms of wards and council – and yet, she’s equally accountable for all our elections and laws as the next person. I’d like at the end of two years to have a process in place to welcome people that gives them insight into what is the governing structure and how they can engage with it. I’d like for that process to include identifying a way residents can get involved in leadership – outside of elected leadership – and I’d like for that to include resident voice in what we do with the budget. Do you think you’ll run for office again? I have not decided. This run was not the first time I had considered. I had a goal to do it by the time I was 35, and I’m grateful it ended in a win. I don’t know, though, if running again is the right next thing for me. But it’s not something I’m closed off to. Who is a woman who has had the most influence on your life? She’s definitely been one of my most long-term friends, and I think that’s made a difference, knowing I don’t just have a mom, but someone who supports me. She told me when I ran, “Leslie, you’re my kid; I’m going to support you. But I need to know why.” I remember so appreciating that. It was so important that I answered then, because halfway through, I realized, it’s not so much what I can get out of it; it’s for the people of Norwood. It’s what can we do to feel good about our story, to love where we live. I want my home to be a thriving community, and that’s going to take all of us.